Bolko I the Strict also known as the Raw or of Jawor, was a Duke of Lwówek (Löwenberg) during 1278-81. 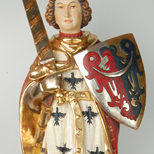 He was the second son of Bolesław II the Bald, Duke of Legnica by his first wife Hedwig, daughter of Henry I, Count of Anhalt. This statue has the size of 60 cm (23.6") and was painted with real gold leaf.